There when you need it (but absent when you don’t), the quick nav bar on your NOOK Tablet is the superhighway to some important functions. To display the bar, touch the Π button on the lower front frame of the tablet. You can get to most of what the quick nav bar has in other ways, but here they’re quicker (imagine!) to navigate to. Tap this virtual button to go back to the main screen, which holds the Daily Shelf. The Home screen also has any other books, publications, or apps you copied onto it. Tapping here opens the portal to all your tablet’s literary content. Buttons at the top take you to shelves. For each, you can choose an organizational scheme. Four of the six sections here (Books, Magazines, Newspaper, and my Stuff) let you choose how the titles are displayed. That organization becomes more important as you acquire more to read. A three-by-three grid of book covers. Shelves that separate books and other documents by the date you last read them. A detailed list of documents, with a small cover and a summary of the contents. A list of even smaller documents, along with the title and author’s name. Books. All the documents that are classified as books. Generally, this means EPUB and some PDF files. If you have your own files or imported public-domain books, they may show up here as books or they may appear in my Files. Magazines. The covers of the most recent editions of magazines you subscribe to, or individual issues you bought. Newspapers. The front pages of the most recent editions of newspapers, whether you bought just a single edition or you’re subscribed. Apps. You can add new features by installing apps. Kids. Because there are books out there for them. My Shelves. Tap the virtual onscreen keyboard to label shelves. My Files. Here is any content that you’ve side-loaded onto your tablet from a laptop or personal computer. 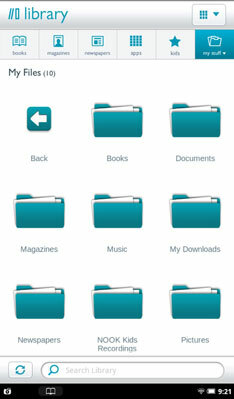 You will see icons for the folders, very much like you would see on a personal computer. Tap one of the folders to open it. LendMe. Here you can see the books in your collection that you can loan to others, any books you’ve borrowed, and any offers made or received for lending or borrowing. Archived. Here are books or other files you have archived. Your files are still on the tablet and available but they’re no longer among current titles. Click here to move to the Barnes & Noble NOOK store. To shop somewhere else, use the web browser. The tab gets you into the NOOK Tablet’s search screen, where you can hunt for any file or app on your device, as well as on the Barnes & Noble NOOK store or the web. You can tap any item in the list to go to it, and you can also tap Search web or Search Wikipedia to go out on the Internet to find out more. 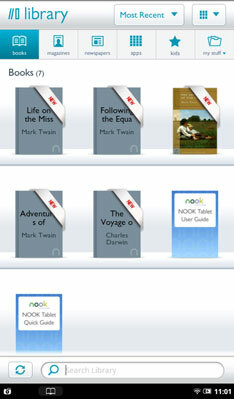 Here’s where the NOOK Tablet shows that it’s more than a mere eBook reader. Apps add new features to your device. Tapping here gives you access to extras supplied with the NOOK Tablet (including Contacts, Email, NOOK Friends, Hulu Plus, Pandora, and games), as well as apps you may buy from the NOOK store. Tap here to open the NOOK Tablet web Browser and move onto the Internet, through an enabled WiFi connection. From here you can navigate, quickly, to the myriad settings panels for everything from the screen brightness, audio volume, WiFi connection, and much more.